06 Nov 2018 --- One serving of nuts a day may help keep weight gain at bay, according to two different studies commissioned by the American Heart Association. One study focuses on Brazil nuts and how they improve satiety and prevent insulin levels from spiking. The other deals with the consumption of nuts and peanuts and how they may help manage weight gain in both men and women. 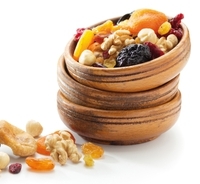 The consumption of nuts was assessed through a food-frequency questionnaire submitted to participants every four years in three different established study groups of 25,394 men in the US Health Professionals Follow-up Study, 53,541 women in the Nurse's Health Study and 47,255 women in the Nurse's Health Study II in follow-up research. One serving of any nut or peanuts daily was associated with a lower risk of weight gain or becoming obese over the four-year intervals. Substituting one serving of red meat, dessert, French fries or potato chips per day with any nut was associated with less weight gain over the four-year intervals. Nuts are a calorific food and people may be apprehensive on whether it is wise to consume them, should they cause them to gain weight. However, the studies show there may be a solid place for nuts in a healthy diet. “People often see nuts as food items high in fat and calories, so they hesitate to consider them as healthy snacks, but they are in fact associated with less weight gain and wellness,” says Xiaoran Liu, Ph.D., first author of the study and a Research Associate in the Nutrition Department of Harvard School of Public Health in Boston, Massachusetts. “Once people reach adulthood, they start to gradually gain about one pound a year of weight, which seems small. But if you consider gaining one pound over 20 years, it accumulates to a lot of weight gain," Liu says. “Adding one ounce of nuts to your diet in place of less healthy foods – such as red or processed meat, French fries or sugary snacks – may help prevent that slow, gradual weight gain after you enter adulthood and reduce the risk of obesity-related cardiovascular diseases,” she adds. The Brazil nut study, followed 22 healthy adults, age 20 or older with a mean body mass index of 22.3, consumed either 36 grams of pretzels or 20 grams of Brazil nuts (about five nuts) in addition to their usual diet. The Brazil nuts and pretzels had approximately the same amount of calories and sodium. Participants ate either the nuts or the pretzels in two trials with a washout period of at least 48 hours to prevent carryover effects. Even though the Brazil nut study mainly followed women and the results can’t be generalized to include men, as only 9 percent of the participants were male, the study found that satiety was significantly higher for people who consumed Brazil nuts and the levels of glucose in their blood remained stable. “While both Brazil nuts and pretzels increased a sense of fullness after they were eaten, eating Brazil nuts stabilized postprandial (after eating) blood glucose and insulin levels, which may be beneficial in preventing diabetes and weight gain,” says Mee Young Hong, Ph.D, R.D., senior author of the study and Professor in the School of Exercise & Nutritional Sciences at San Diego State University in San Diego, California.